Their team name may suggest a certain nonchalance, but Italy’s Team #idontgiveanapp is anything but apathetic about the well-being of its target users. 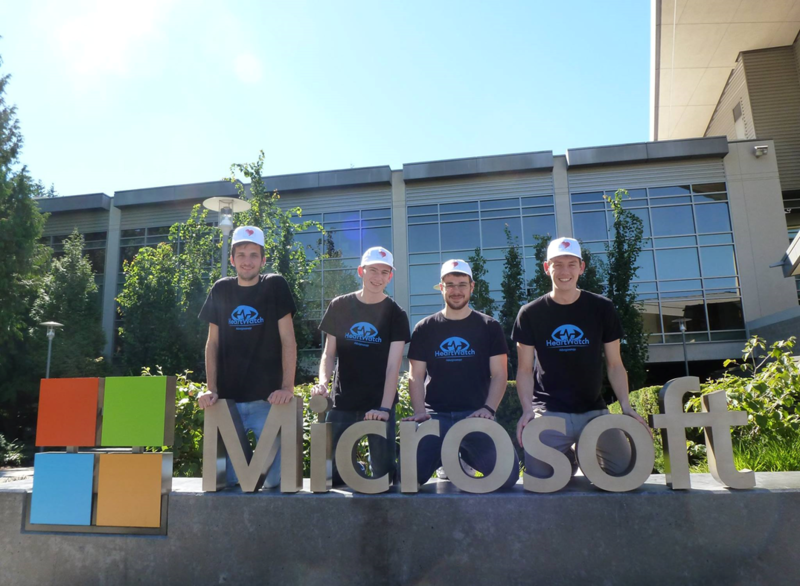 The team, winners in the recent Imagine Cup World Citizenship Semi-finals in Seattle, have created the HeartWatch app, designed to detect cardiac arrhythmia and help patients better manage their health. Constantly checking users’ heartbeats via the Microsoft Band, HeartWatch notifies users about any anomaly their heart may experience. In serious cases, HeartWatch even notifies a selected list of friends and relatives, via SMS. When the team was in Seattle recently, we had a chance to catch up with member Matteo Pilotto, a graphic designer and the only non-developer member of the team. Pilotto and his teammates, C# developers Luca Bruno, Luca Montanari and Guido Magrin, have created something truly life-changing. According to Pilotto, “Often, cardiac arrhythmia doesn’t show visible symptoms, so the problem is in detecting [it] earlier.” To do that, Team #idontgiveanapp has built its HeartWatch app to provide users with the information they need in a straightforward, easy-to-use format. “It is quite simple,” Pilotto says, “because everyone can download this app – from a 20-year-old to an 80-year-old.” Once it’s downloaded, users enter their biometric stats and, as long as they are connected to the Microsoft Band, they receive multiple levels and types of alerts if their heartrate is outside of their normal range. And, maybe most important, the app’s emergency function automatically texts a pre-selected list of five contacts when users don’t respond to the alerts, potentially saving lives. Their goal is to keep this service free, enabled by the cloud, and accessible to as many people as possible. Meet Team #idontgiveanapp, yet another demonstration of the power – and potential — of teaching young people to code. Enjoy today’s Daily Edventure! This entry was posted in Entrepreneurship, Imagine Cup, Information, People, Student Voice and tagged #idontgiveanapp, Imagine Cup, italy. Bookmark the permalink.